Background and objectives Circulating autoantibodies against the M-type phospholipase A2 receptor (anti-PLA2R) were recently identified in the majority of patients in the United States with idiopathic membranous nephropathy (iMN). The objectives of this study were to assess the prevalence of anti-PLA2R in a separate, European cohort of iMN patients and to correlate the presence of anti-PLA2R with clinical parameters reflective of disease activity. Design, setting, participants, & measurements Anti-PLA2R levels were blindly assessed by a Western blot immunoassay in 54 serum samples from 18 patients with iMN collected in various stages of clinical disease. 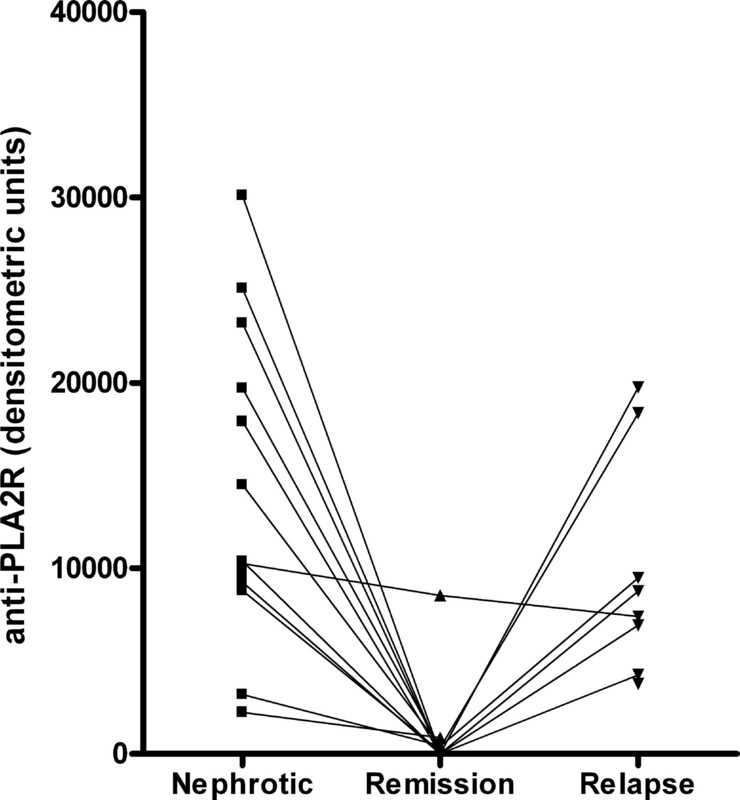 Anti-PLA2R levels were correlated with other clinical parameters. Results 77.8% of iMN patients in our cohort had antibodies reactive with human PLA2R. The antibody levels in these patients correlated strongly with both clinical status and proteinuria (r = 0.73, P < 0.01). Conclusions The role of PLA2R as a major antigen in iMN was confirmed in an independent, European patient cohort, and levels of circulating anti-PLA2R revealed a strong correlation with clinical disease activity. We propose that detection and measurement of these autoantibodies may provide a tool for monitoring of disease activity and treatment efficacy. Idiopathic membranous nephropathy (iMN) is a single-organ autoimmune disease and a common cause of the nephrotic syndrome in adults. Accumulated evidence from the experimental rat model of Heymann nephritis and alloimmune membranous nephropathy (MN) from fetomaternal immunization to neutral endopeptidase has advanced the hypothesis that, in human MN, a circulating antibody reacts with and binds to a primary antigenic target on podocytes (1–4). Further insights into the pathogenesis of human disease were established in the past few years, as several other podocyte target antigens have been proposed on the basis of the presence of circulating antibodies in patients with MN (5,6). Recently, we have identified circulating autoantibodies against the M-type phospholipase A2 receptor (PLA2R) in the majority of patients with iMN (5). Cumulative data from serum samples obtained in the Northeastern United States have shown that greater than 70% of patients with iMN have these autoantibodies, primarily of the IgG4 subclass, that are reactive with native and recombinant human glomerular PLA2R. We have also documented a preliminary association of the presence of circulating anti-PLA2R with clinical disease activity (5). The goal of this study was therefore to assess the prevalence of anti-PLA2R in a separate, European cohort of iMN patients and to correlate the presence of anti-PLA2R with the clinical parameters reflective of disease activity. In the Nijmegen Medical Center, patients with recently diagnosed membranous nephropathy are evaluated using a standardized protocol as described (7). In brief, blood samples and timed urine samples are collected for the measurement of serum creatinine, albumin, cholesterol, β-2-microglobulin (β2m), IgG, and transferrin, as well as urinary excretion of creatinine, β2m, albumin, IgG, transferrin, and α-1-microglobulin. In addition, aliquots of serum and urine are centrifuged, and the supernatant is stored at −70°C. The patients are prospectively followed with repeated serum and urine collections, and additional data on treatment, remission, and survival are obtained. This protocol was approved by the ethics committee of our center. All of the patients gave written informed consent. Serum samples of patients with a biopsy-proven iMN and a nephrotic syndrome were collected at several time points during their disease and treatment course. Membranous nephropathy was considered to be idiopathic when no secondary cause of MN was suspected on the basis of clinical and laboratory criteria. The samples were categorized by J.M.H. and J.F.W. as: nephrotic syndrome (serum albumin, <3.0 g/dl; proteinuria, >3.5 g/d), spontaneous remission (proteinuria reduction of >50% with proteinuria <3.5 g/d, no treatment with immunosuppressive drugs), treatment-induced remission (proteinuria reduction of >50% with proteinuria <3.5 g/d after treatment with immunosuppressive agents), persistent proteinuria (proteinuria >3.5 g/d or proteinuria reduction <50%), or relapse (proteinuria >3.5 g/d after a period of remission). Coded samples were analyzed by L.H.B. and D.M.B. (Boston University) without knowledge of the clinical status for the presence of anti-PLA2R by Western blotting against human glomerular proteins under nonreducing conditions. The sera were tested at 1:25, which has been shown to be both sensitive and specific for iMN (5), followed by detection of human IgG4. For those samples that were negative for IgG4-anti-PLA2R, the immunoassay was repeated for total IgG anti-PLA2R. The results were standardized with the use of a single known reactive MN sample, assayed under identical conditions for each experiment. The bands corresponding to PLA2R were scanned on a Hewlett Packard flatbed scanner, and densitometry was performed using National Institutes of Health ImageJ. The 46 available positive samples were tested in two separate batches. Twenty-four samples were run in both batches to serve as internal controls. The correlation between anti-PLA2R levels measured in the first and second runs was 0.97. For descriptive statistics, the data are presented as the means (± SD) or medians (range) when appropriate. The correlation between two parameters (nonparametric distributions) was analyzed by Spearman's rank coefficient of correlation. Mann-Whitney U and Kruskall-Wallis tests were used for comparison between groups. All of the statistics were performed using SPSS software, version 17.0 (Chicago, IL). The differences were considered significant with a P value < 0.05. We measured anti-PLA2R levels by a Western blot immunoassay in coded serum samples from patients with iMN collected when they were nephrotic, in spontaneous or treatment-induced remission, or in relapse (see Study Population and Methods above). Fourteen of 18 (77.8%) iMN patients had IgG4 autoantibodies to PLA2R in their baseline sample (taken during a period of nephrotic syndrome). One of these patients did not show reactivity at presentation but showed reactivity in a serum sample taken 4 months later, while persistently nephrotic. The four patients who were nonreactive for IgG4 anti-PLA2R were also negative when the immunoassay was repeated with an assay for total IgG anti-PLA2R. Baseline characteristics of all patients are given in Table 1. In these small groups there were no significant differences between the anti-PLA2R-positive and -negative patients with respect to age, gender, serum creatinine, serum albumin, or renal function. In those patients positive for anti-PLA2R, the level of autoantibodies as established by densitometry correlated well with several baseline characteristics that are related to the severity of disease. The anti-PLA2R level correlated positively with proteinuria (r = 0.73, P < 0.01, Figure 1), serum β2m (r = 0.72, P < 0.01), urinary IgG excretion (r = 0.70, P = 0.03), urinary β2m excretion (r = 0.67, P < 0.01), and serum creatinine (r = 0.57, P = 0.03). Anti-PLA2R level was negatively correlated with estimated GFR (r = −0.53, P = 0.049). 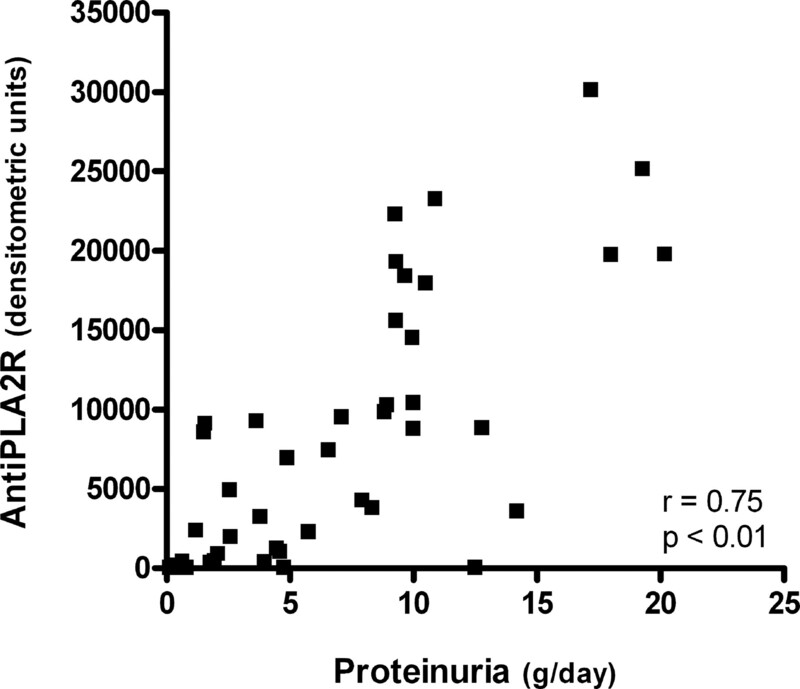 Correlation between the anti-PLA2R antibody level and proteinuria (baseline samples, n = 14). Densitometry of the anti-PLA2R Western blot signal also correlated well with clinical status during follow-up (Table 2). In 12 patients positive for anti-PLA2R autoantibodies at baseline, a subsequent sample obtained during complete or partial (urine protein <3.5 g/d) remission was available. Remissions could be both spontaneous or treatment-induced. However, when proteinuria at baseline was >10 g/d, no spontaneous remissions occurred. Median time from presentation to onset of remission was 18 months (range, 11 to 45). In seven of the patients, there was also a third sample obtained after a relapse of proteinuria. In one patient (Table 2, Patient 6), a spontaneous remission occurred 16 months after the initial presentation. For this remission there was no sample available, but subsequent samples were obtained during a relapse of proteinuria and a second spontaneous remission after this relapse. Overall, anti-PLA2R levels were high in the initial phase of nephrotic syndrome, decreased significantly during remission, and increased again during relapse (P < 0.01 Kruskall-Wallis test; Figure 2). In these small groups there were no differences between spontaneous or treatment-induced remissions. Of note, an abnormal pattern was seen in one patient in whom the anti-PLA2R level did not decrease during partial remission of proteinuria (see Figure 2 and Table 2, Patient 7). In this patient, a relapse of nephrotic range proteinuria occurred during subsequent follow-up and was accompanied by progressive loss of renal function. Anti-PLA2R-autoantibody levels during the clinical course of 13 anti-PLA2R-positive patients with remission of proteinuria during follow-up. Nephrotic, sample taken during period of proteinuria >3.5 g/d with serum albumin <3.0 g/dl; Remission, sample taken during clinical remission with proteinuria <3.5 g/d; Relapse, sample taken during clinical relapse of proteinuria >3.5 g/d after a period of remission. We have recently re-evaluated the eight patients who had a relapse of proteinuria after a period of remission. Median follow-up from relapse to final evaluation was 26 months (range, 12 to 96). In three patients, severe proteinuria persisted (median proteinuria, 9.3 g/d; range, 9.3 to 14.2), and in these individuals, the levels of anti-PLA2R were stable or increased (see supplemental Figure e1 available at the website). In five patients, proteinuria decreased from median 8.3 (range, 6.6 to 10.0) to 4.0 g/d (range, 1.2 to 4.8). In these patients, anti-PLA2R-autoantibody levels decreased or even disappeared (Figure e1). Of note, when plotting all of the available data of anti-PLA2R levels against proteinuria, a significant correlation was again observed (r = 0.75; Figure 3). 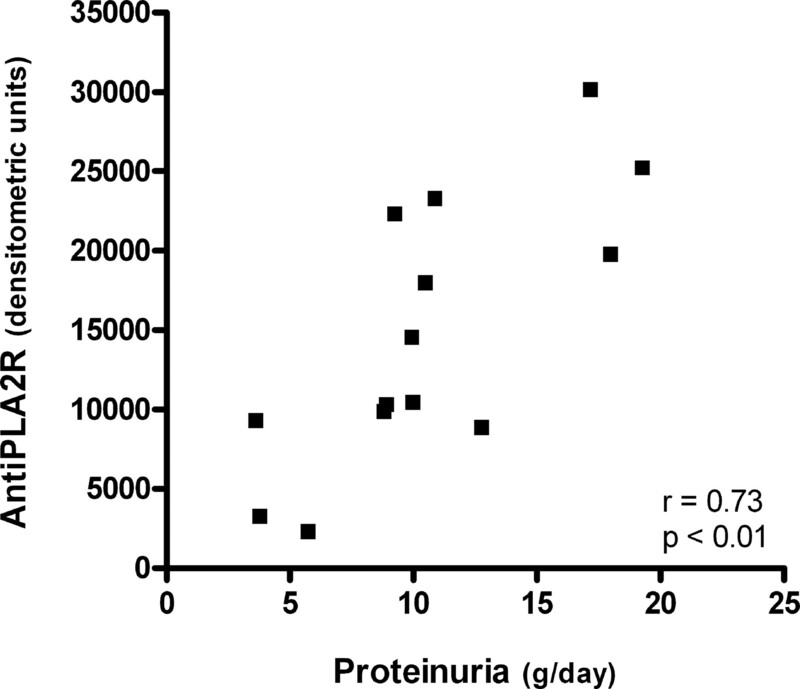 Correlation between the anti-PLA2R antibody level and proteinuria. All of the samples were taken during the clinical course (n = 46) from 14 patients with positive aPLA2R antibodies at baseline. We found that 77.8% of iMN patients in our European cohort had antibodies reactive with human PLA2R, similar to the proportion of anti-PLA2R-positive primary MN patients in the United States (5) and other international iMN-patient cohorts (L.H.B., unpublished observations). Although the exact mechanisms and the role of PLA2R in pathogenesis of iMN are currently still unknown, these data strengthen the role of PLA2R as the major target antigen in iMN. Other recently described antigens may play a role in our anti-PLA2R-negative patients (6). Our blinded analysis of samples collected at various stages of clinical disease activity revealed a clear association of anti-PLA2R antibodies with clinical status as defined by proteinuria. Anti-PLA2R levels were high when patients had nephrotic levels of proteinuria, were substantially decreased or absent in the setting of spontaneous or treatment-induced remission, and were again increased in association with disease recurrence. Remarkably, we observed that the level of anti-PLA2R as semiquantitatively assessed by immunoblotting was positively correlated with the amount of proteinuria. This was not only true for baseline samples but also when combining all data obtained during follow-up. Although a clear causal relationship cannot be established by these data, it is tempting to speculate that higher titers of anti-PLA2R autoantibodies may lead to more subepithelial antibody-antigen immune deposits, greater podocyte damage, and thus increased levels of urinary protein. This hypothesis is further strengthened by the observation that anti-PLA2R-autoantibody levels at baseline also strongly correlated with other markers of renal damage such as urinary excretion of β2m and IgG and serum-creatinine levels. Future work is needed to determine whether these antibodies are directly pathogenic to the human podocyte. In two patients, findings were seemingly inconsistent. In one patient, anti-PLA2R autoantibodies were absent at first presentation but clearly positive 4 months later. In the second patient, anti-PLA2R autoantibodies remained present during remission and were absent with increasing proteinuria during follow-up. We have no biologically plausible explanation for the findings in the first patient. Autoantibodies were absent in the sample taken at presentation, shortly after a renal biopsy that exhibited all of the features typical of an idiopathic membranous nephropathy and at a time when the patient was severely nephrotic (proteinuria, 12.5 g/d; serum albumin, 2.4 g/dl). Because the repeated sample was strongly positive, we have to acknowledge the possibility of an inadvertent mislabeling of the first specimen. We have proposed that the immunologically active phase of MN (defined by the presence of circulating anti-PLA2R antibodies) must end before a corresponding improvement is seen in proteinuria or other clinical features (8). This makes sense conceptually, because some degree of recovery of both the glomerular basement membrane and podocyte structural damage need to occur before the proteinuria can completely resolve. Residual proteinuria may at times remain indefinitely in the absence of immunologic activity, because of tubulointerstitial damage or secondary glomerular changes from prolonged disease. For this reason, a definition of partial remission based only on urinary protein may be flawed, because similar levels of proteinuria can occur with or without the presence of immunological activity. It is thus possible that our patient, in whom there was no anti-PLA2R detectable in the sample at the end of follow-up, although there was still a persistent proteinuria of 4.8 g/d, had actually already remitted immunologically but had residual proteinuria on the basis of secondary focal segmental glomerulosclerosis lesions. The serum-albumin level at that moment had slightly increased to 3.3 g/dl, which in our opinion supports the diagnosis of secondary focal segmental glomerulosclerosis rather than active membranous nephropathy. Variability in proteinuria caused by dosing and compliance with inhibitors of the renin-angiotensin system and/or declining renal function may also lead to spurious conclusions about remission status that are based only on amounts of urinary protein. Thus, in the patient in whom anti-PLA2R antibody levels were detected despite a clinically-defined remission, the lower level of urinary protein may not have been reflective of a true immunological remission. Indeed, the patient's eventual progressive loss of renal function is consistent with persistent immunological disease activity throughout this apparent remission. This point may become relevant in patients with advanced renal failure from iMN who are eligible for transplantation, because the presence or absence of anti-PLA2R auto antibodies may influence the potential for recurrent disease in the allograft (9). However, further studies are warranted to establish the risk of recurrent iMN in anti-PLA2R-positive patients. In conclusion, the role of PLA2R as a major antigen in iMN was confirmed in an independent, European patient cohort, and levels of circulating anti-PLA2R revealed a strong correlation with clinical disease activity. Furthermore, although anti-PLA2R-autoantibody levels correlated strongly with proteinuria, we propose that both can also provide independent information, especially when they are discordant. In those occasions when low or absent anti-PLA2R levels indicate the remission of immunologic activity, “residual” proteinuria may reflect as-yet unresolved structural changes in the glomerulus or interstitial/tubular damage. We propose that detection and measurement of these autoantibodies may play an important role in the monitoring of disease activity and treatment efficacy. Larger studies are clearly needed to confirm our data and to evaluate the sensitivity and specificity of change in anti-PLA2R-autoantibody level for predicting a change in disease activity in the individual patient. L.H.B. and D.J.S. have received consulting fees and research support from Questcor Pharmaceuticals, Inc. This work was supported in part by National Institutes of Health Grant DK30932 (to D.J.S.) and a career development grant from the American Society of Nephrology/Halpin Foundation (to L.H.B.). J.F.W. and J.M.H. are supported by Grant OW08 from the Dutch Kidney Foundation. The results presented in this paper have not been published previously in whole or part, except in abstract format. The data were in part previously presented at the 42nd annual meeting of the American Society of Nephrology (October 27 through November 1, 2009; San Diego, CA) and published in abstract format (J Am Soc Nephrology 20: FC012, 2009). L.H.B. and D.J.S. report having a patent pending for a diagnostic immunoassay to detect anti-PLA2R autoantibodies in membranous nephropathy. J.M.H. and L.H.B. contributed equally to this work. D.M.B. is currently a medical student at New York University School of Medicine, New York, New York.